The Tires DO NOT touch!! do the individual tires have their own drive and then when it hits an obstacle they turn due to this? Or does it drive the center, and the wheels turn over each other? 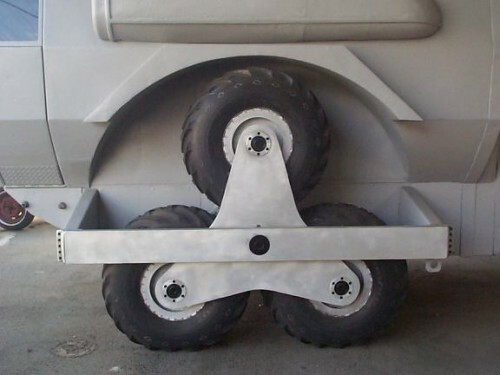 Centre axle, then 3 wheel-axles. At the chassis, there is some sort of an independent chain-gearbox-thing running from a gear on the central axle to each wheel axle. There’s probably an independent motor for each wheel, to make sure the drive is stable when on rough terrain… Maybe. That’s what I was thinking aswell. also. It rolls over when it hits obstacles. 2 wheels in contact at a time, and it rolls over to climb up or down staggered inclines or obstructions. Ok, things makes thing ALL BETTER for me. Great concept! It’s not gay if the wheels don’t touch.